The latest literary news from Slovakia, Hungary, and the Nordic countries. 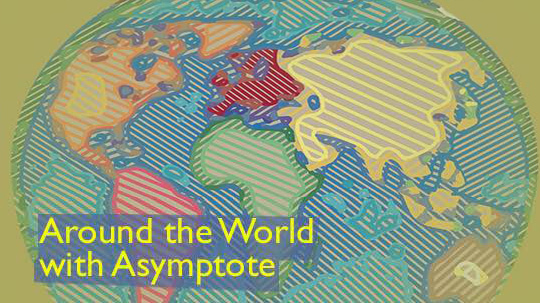 Friday is once again upon us, dear Asymptoters! This time, our report brings you the latest literature in translation news from Europe. Editor-at-Large for Slovakia Julia Sherwood has been at the Central European Forum conference and Blog Editor Hanna Heiskanen attended the Helsinki Book Fair, while Zsofia Paulikovics has an update from Hungary. Enjoy the ride! On 20 October, the emerging writer Dominika Madro’s story Svätyňa [Sanctuary] won the annual short story contest Poviedka 2016. Now in its twentieth year, the competition is run by the publisher Koloman Kertész Bagala and all submissions are anonymous. This year’s runner-up was the story Šváby [Cockroaches] by novelist and Elena Ferrante’s Slovak translator and Asymptote contributor Ivana Dobrakovová. A survey of reading habits, commissioned by the Slovak Publishers’ and Booksellers’ Association, has recently published very depressing findings: 72 percent of the public don’t buy a single book in any year; 40 percent read books only once a month and 28 percent don’t read at all. Nevertheless, judging by the crowds attending a huge variety of literary events taking place across the capital, Bratislava, over the past month, the picture isn’t perhaps quite as bleak as these figures suggest. Slovak-Swiss writer and journalist Irena Brežná, Polish novelist Grażyna Plebanek, and recent Neustadt Prize winner Dubravka Ugrešić sought antidotes for despair as part of Bratislava’s annual Central European Forum conference from 11 to 13 November (video recordings here); Dubravka Ugrešić also read from her book of essays, Europe in Sepia, which will be published soon in a Slovak translation by Tomáš Čelovský. Parallel with the conference, some 200 publishers displayed their recent publications at the Bibliotéka Book Fair, held in the somewhat drab Incheba exhibition halls and vying for space with a “World of Minerals” exhibition. At the Centre for the Information of Literature stand two young authors, Peter Balko and Peter Prokopec, along with graphic designer David Koronczi, introduced their new “anti-logy” of Slovak writing. Aimed at schools but very far from being a stuffy textbook, Literatúra bodka sk (Literature.dot.sk) aims to show that contemporary authors inhabit the same world and share the same sensibilities as young readers, and includes samples of fiction and non-fiction as well as a graphic novel, Rudo, by Daniel Majling. 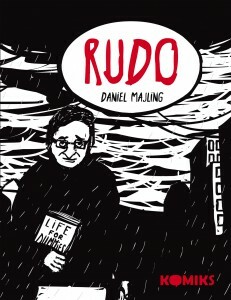 Rudo started life as a Facebook cartoon strip and has now been issued in book form by Czech publisher Labyrint (in a Czech translation! ).